The whole idea is to use music as a therapy and create a utilitarian album that can also serve health benefits to its listeners . The album comprises of 7 day playlist where each day recomend atleast 10 minutes of listening of ragas. 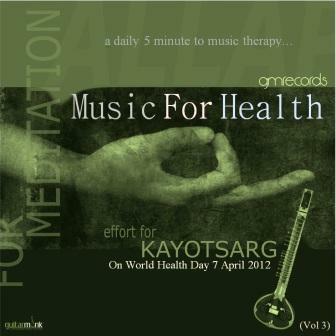 I invite you to use this therapeutic raga album for health and share your experience. Thanks for stopping by my Post today! Music is a great healer in that it enters a different part of our consciousness. It soothes pain, calms the spirit, and so much more. Thank you for using your great gift! This interesting. I wish I could buy an album, but I’m from the U.S. I don’t know if it will ever be available here. It seems to me that something that could reduce stress in 5 minutes would be worth trying. Ragas Study of Indian Music is prevalent since ancient times. It’s said that each raga focus on a particular mood and act as a catharsis. Art in all of its forms is one of those rare gifts that can bring deep healing of all kinds. Music, perhaps, most of all . . .